Message: Save an extra £150 per booking on long haul holidays. Valid for bookings made from tomorrow (Thursday 23rd March). Valid on any Thomson flight only booking to Florida departing between 01 May 17 and 30 June 17. 20kgs on baggage must be selected at the flight options page, bags will not be included automatically. Promotional offer only applies to 20kgs of baggage, if a customer selected 25kgs of baggage the promo code can still be used but the difference must be paid for. 1. Save an extra £100 per booking including children aged 2 and over on package holidays. 2. Discount is valid on our package holidays departing between 1st May 2017 and 31st October 2017. 3. The minimum spend is £1000 per booking and before any extras such as insurance, room upgrades & selecting seats, are added. 5. The offer does not apply to group bookings of more than 9 people, hotel only, flight only, and cruise or ski bookings. 6. This offer is only valid for new bookings and can only be redeemed once. 7. Enter the code SALE100 in upper case when on the holiday payment page of our website, the code will be applied in store. Normal booking terms and conditions apply. 8. The offer is subject to availability and may change or be withdrawn without notice. This promotional code is non-transferable and not valid in conjunction with any other discount code. 9. Promoter?s Details: Thomson is a trading name of TUI UK Limited, a member of TUI Group. Registered office: TUI Travel House, Crawley Business Quarter, Fleming Way, Crawley, West Sussex, RH10 9QL. Registered in England No: 2830117. Terms and Conditions: Free kids offer applies to new bookings only, on selected summer 2016 and summer 2017 holidays, subject to limited availability. Only 1 free kids place is available in each selected hotel room or selected apartment type or villa with 2 full paying adults. Other children must pay the full brochure price. Available on Thomson holidays only. Free child places cannot be combined with online discount. Terms and Conditions: Offer applies to new bookings only, on short haul and mid haul Skytours & Scene holidays applicable to departures 1st May 2017- 31stOctober 2017. The offer is valid from 21st December 2016 on thomson.co.uk and in Thomson stores. The offer does not apply to hotel only, flight only, and cruise or ski bookings. This offer can only be redeemed once. Normal booking terms and conditions apply. The offer is subject to availability and may change or be withdrawn without notice. The low deposits offer applies unless a booking is made within 12 weeks of departure, where full payment is required. Terms and Conditions: The £600 saving refers to the total savings made on package holidays departing between 1st May and 30th June 2017 on a holiday based on 2 adults sharing. 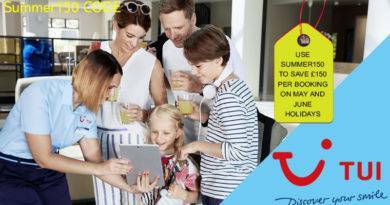 The offer applies to 14 night holidays booked on thomson.co.uk and does not apply to flight only, any holidays where the flight is not a Thomson Airways aircraft, accommodation only and cruise. Savings are from the latest edition of the relevant brochure. Additional supplements may apply. Terms and Conditions: The £600 saving refers to the total savings made on package holidays departing between 1st July and 31st October 2017 on a holiday based on 2 adults sharing. The offer applies to 14 night holidays booked on thomson.co.uk and does not apply to flight only, any holidays where the flight is not a Thomson Airways aircraft, accommodation only and cruise. Savings are from the latest edition of the relevant brochure. Additional supplements may apply. Lakes and Mountains and Marella Cruise - formerly Thomson Cruise. All holidays on this website are related to those companies who are all part of the TUI group. The only offers on this website also will be from TUI group.